Our Removals Division covers all domestic removals whether it is for an entire household or few items. As such we are in the unique position of offering a one-stop service. AVM Storage and Shipping is proud to provide professional removal, storage, shipping and logistics solutions for private and business sectors. Established for many years, we have built up a comprehensive and highly respected storage and distribution company based in Cheltenham, covering Cheltenham, Oxford and Worldwide, with a reputation for providing a customer focused, professional and cost effective service worldwide. We are located under 5 minutes from the M5, close to London and major shipping ports, providing fast and effective service. The location we are based at enables us to be highly connected with all motorways. This enables our services to be efficient and cost effective for our customers. 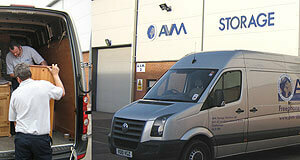 AVM Storage and Shipping offers a one stop shop. We offer safe and secure storage options at competitive rates, experienced liveried personnel & professional packers to assist with removals and packing and fast all inclusive shipping and transportation of goods worldwide.The team is highly experienced in all the services we provide ensuring that all of the services we offer will be completed in a professional manner. We also offer the highest quality of customer service to ensure that we take care of all of our customer’s individual needs. Our friendly staff will be happy to discuss your requirements and assist you in every way they can, so give us a call. The staff is highly knowledgeable about all the services we offer and will be able to offer helpful and relevant advice. The staff is also able to tailor the service we provide to your specific needs. All packaging material orders can be customised for your individual needs. Give one of our professional and friendly team members a call today. Our Removals Division covers all domestic removals whether it is for an entire household or just a few items. Our flexible service includes professional packing service, insurance and the vehicle or vehicles necessary to cater for your individual tailored requirements. We provide a full professional packing service.Staffed by a team of professional packers. From providing packing kits for self packing to full household packing, groupage (palletising, wrapping and banding), and export wrapping for international shipping. We offer a one-stop delivery/ collection management service handling the entire process from order through to delivery or collection, as well as dedicated 1 and 2 man delivery options.Pre-delivery phone call.Experienced liveried personnel.